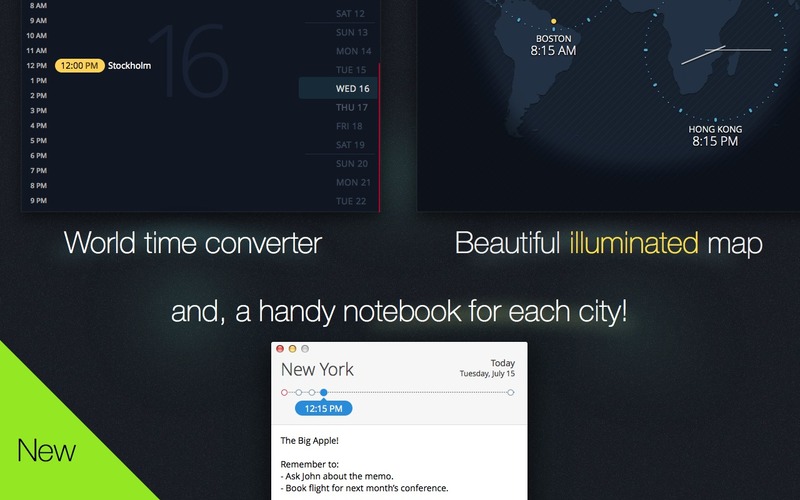 Convert world time, view illuminated world map, save notes for cities. Is there a better alternative to Time Travel? Is Time Travel really the best app in Productivity category? Will Time Travel work good on macOS 10.13.4? Time Travel is a one-of-a-kind time converter, a beautiful illuminated world map, and a place to store notes about your important cities. Time Travel is especially handy for scheduling times with remote contacts. For example, you'll find it indispensable to quickly find a time that is early morning weekday hours in Sydney AND that doesn't fall on a weekend in your city. 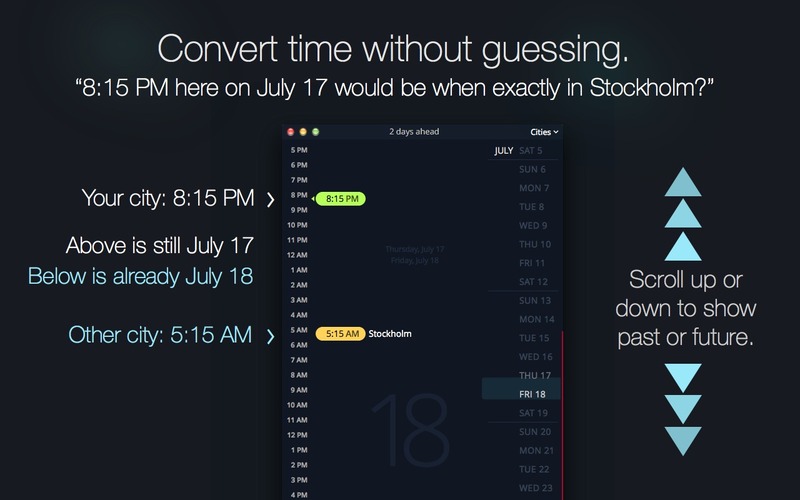 Convert time without the need to laboriously enter hours, minutes, or days: simply scroll up and down to move time. Visualize time difference between cities. Time Travel needs a review. Be the first to review this app and get the discussion started! Time Travel needs a rating. Be the first to rate this app and get the discussion started! 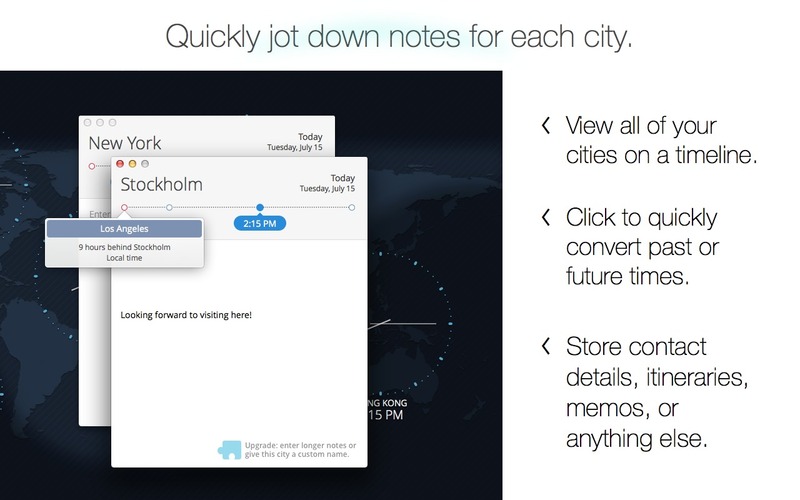 Annotate each city with notes to keep track of your contacts, itineraries, or other plans. See all of your cities at a glance on a beautiful map. And it's ready to customize: drag to reposition, resize to make important cities bigger, or go full-screen. 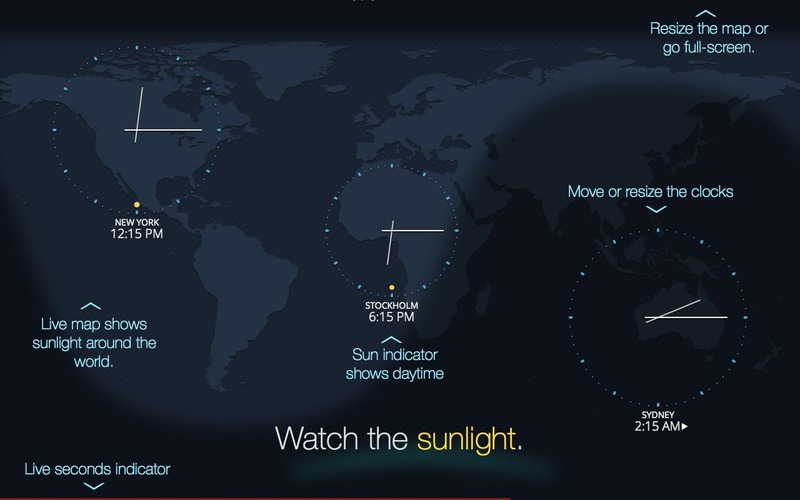 Watch the sun move: areas with daylight are illuminated on a map using astronomical data. Keyboard shortcuts are included in the time converter to help you be more productive. A full reference is available within the app. And of course, Time Travel comes with a pixel-perfect, handcrafted design that will shine on your Mac. Much longer notes, and the ability to rename any city -- for example, you can rename New York to "NYC" or to "Corporate HQ." 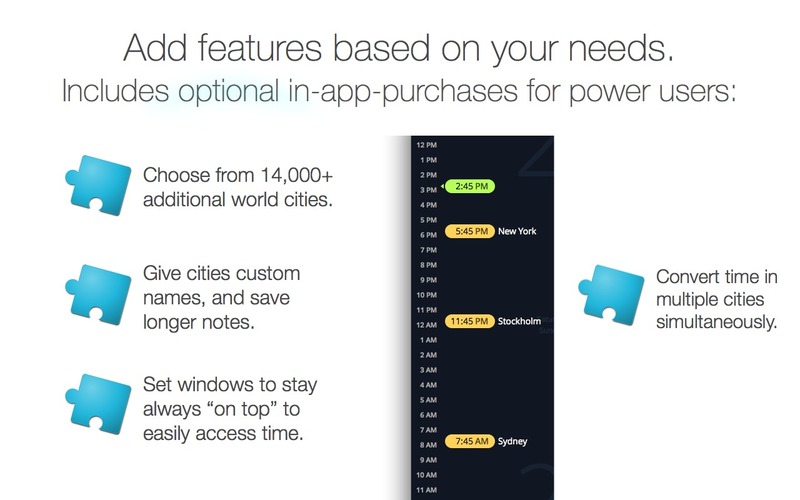 Instantly convert time between more than two cities -- for example, if you're frequently scheduling with multiple world-wide contacts. Also, copy the currently selected time to Clipboard. "Pin" the app's windows to appear "on top" if you'd like to keep time always on the screen.